Last year, I wrote about the explosive growth of mobile broadband in Sweden. According to the National Post and Telecom Agency (PTS), which publishes an annual report on the state of the Swedish Telecommunications Market, the number of mobile subscriptions via data plug-in cards or USB modems increased from 92,000 to 376,000 (a growth rate of around 309%) during 2007. The rate of growth in mobile data traffic was even steeper – total mobile data traffic increased by over 1000% during 2007 (from 203 TB to 2,191 TB). Well, the PTS has come out with the 2008 report on the Swedish Telecommunications Market highlighting the state of the mobile broadband in Sweden last year. The number of active customers with broadband in Sweden increased from around 3.156 million to 3.782 million between 2007 and 2008, corresponding to a growth of approximately 20 per cent. Mobile broadband represented 80 per cent of this increase, proving once again that people with dial-up connections are choosing mobile broadband over fixed broadband. Naturally, mobile broadband traffic continues to grow as the accompanying picture shows – traffic grew from 2191TB to roughly 9TB (a growth rate of over 310%). As the accompanying chart demonstrates, most of this traffic is being carried by 3’s network. The average monthly data per subscription has increased to 1.8 GB and there was a great variation between the various operators. In particular, 3 is carrying the bulk of this traffic with its average monthly data traffic per subscription as high as 4.5 GB. Btw, 3 Sweden is the only operator that I have come across that offers different price levels based on the speed of the modem. Three different price levels corresponding to maximum download speeds of 2Mbps, 6Mbps and 10Mbps are being offered – presumably, the choice of modem restricts the maximum download speed. It is an interesting twist to mobile broadband pricing where the predominant model is based on monthly usage quotas and throttling of user traffic once the quota is exceeded. According to the latest data from the UK broadband comparison website Broadband Genie, only around one in ten (11 per cent) mobile broadband users are satisfied with the speed of their mobile broadband. The data claims that exaggerated advertising and unrealistic ‘up to’ speed claims have given the public an unrealistic expectation of mobile broadband that the service cannot live up to. And of course, some operators are better than others as this comparison between Vodafone UK and 3 UK shows. At least from this person’s experience, 3’s mobile broadband service just does not work. The consensus opinion is certainly that mobile broadband is not a profitable business (yet) in Western Europe (especially in countries like UK) where mobile broadband prices are trending lower than fixed broadband prices. I have always wanted to do a quantitative analysis. So if you use the 2 Eurocent per MB number, 1 GB costs ~20 Euros (or 18 pounds) significantly more than the 10 pounds that 3 seems to be charging for the 1 GB package. Assuming a user who signs up for a 7 GB package uses ~2 GB, the cost for 3 to support that user is ~36 pounds which is still a lot higher than 25 pounds. 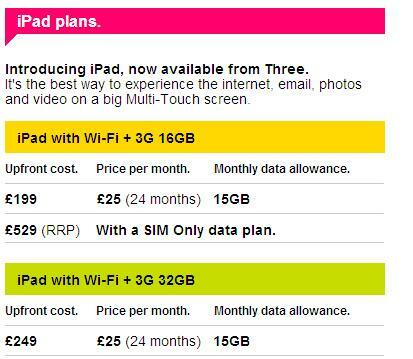 I am not sure about you, but I sure don’t see how 3 is making money on these mobile broadband packages. The average flat rate package bundle provided has doubled over the last 12 months to almost 4GB (based on the analysis of 100 mobile operators). The most common monthly user allowance price point on offer across Europe is now 5GB and 10GB, closely followed by 1GB and 500MB allowances. Pricing in 2008 has fallen by an average of 4% across all countries when compared with the previous year – even though average user allowances have more than doubled. In some countries, mobile broadband pricing has fallen even steeper – as much as 53%, 43% and 35% in Latvia, Austria and the UK respectively over the past year. In Ireland, Germany, Sweden and Spain average mobile broadband prices are now significantly lower than the most popular fixed line DSL broadband service, which is driving customers to the mobile broadband offer. I have pointed out this phenomenon earlier in here and here. Ireland and Sweden have always been mobile broadband leaders. Looks like Spain and Germany are following their lead as well. The most striking feature has been the continued increase in monthly user allowances which have more than doubled last year while pricing has continued to decline. The implication is that the Euro/MB has fallen by more than half – not a very good sign for the operators. Clearly, the key challenge for the operators is to translate the explosion in user growth into profitability. The report also finds that flexible tariff structures that allow for per day and per week pricing (also called pay-as-you-go plans such as O2’s recent offerings) are now available in the market place. Verizon Wireless DayPass – Xohm’s Selling Points Weaken! One of the supposedly big selling points of Xohm – Sprint Nextel (now Clearwire) – WIMAX service was the availability of flexible pricing models that does not tie the customer for an entire month. For example, it looks like they have a Daily On-the-Go service that provides 24 hours of continuous Internet service. They have a $5 per day special offer that lasts until the end of the year (after which it goes back to its regular rate of $10 per day). 3 in UK has been offering Pay-As-You-Go pre-paid plans for a while now, though they are not strictly what you would call day plans. Out here in the US, Verizon Wireless has upped the ante with its BroadbandAccess DayPass plan which allows you to experience the Internet continuously for 24 hours for $9.99 per day. According to the website, it can be used on select notebooks from Dell, HP, Lenovo, Panasonic, and OQO, or with a Verizon Wireless USB modem or ExpressCard. Self-activation is possible and additional sessions can be purchased via the connection manager. There have been complaints that claim that Verizon forces you to sign up for their cell phone plans and it is really not that simple as the website makes it out to be. In any case, I hope that Verizon Wireless has fixed those issues for this is truly a product that will have an adverse impact on Sprint’s Xohm service.